The term smart environment refers to physical spaces equipped with sensors feeding into adaptive algorithms that enable the environment to become sensitive and responsive to the presence and needs of its occupants. People with special needs, such as the elderly or disabled people, stand to benefit most from such environments as they offer sophisticated assistive functionalities supporting independent living and improved safety. In a smart environment, the key issue is to sense the location and identity of its users. In this paper, we intend to tackle the problems of detecting and tracking humans in a realistic home environment by exploiting the complementary nature of (synchronized) color and depth images produced by a low-cost consumer-level RGB-D camera. 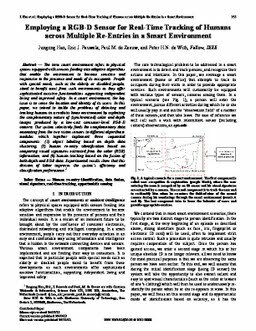 Our system selectively feeds the complementary data emanating from the two vision sensors to different algorithmic modules which together implement three sequential components: (1) object labeling based on depth data clustering, (2) human re-entry identification based on comparing visual signatures extracted from the color (RGB) information, and (3) human tracking based on the fusion of both depth and RGB data. Experimental results show that this division of labor improves the system’s efficiency and classification performance. Han, J, Pauwels, E.J.E.M, de Zeeuw, P.M, & de With, P.H.N. (2012). Employing a RGB-D Sensor for Real-Time Tracking of Humans across Multiple Re-Entries in a Smart Environment. IEEE Transactions on Consumer Electronics, 58(2), 255–263.